Homemade yogurt is something we started to do in 2009. I actually bought this yogurt maker for Paul as a Christmas gift, and I don’t think he has touched it. But I sure have made a lot of yogurt for us! 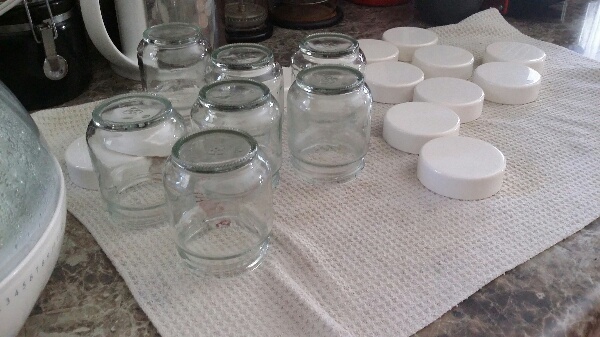 Above I have cleaned and sanitized the jars. This is an easy and necessary step to get a good, clean yogurt. This is not our own recipe, but this is how we make our yogurt. Pour the milk into a sauce pan and heat up until bubbling on the sides, right before it boils. It should be 180°F if you check the temperature. Let the milk sit until it comes down to 100°F – 110°F. Whisk in 1 tbsp store bought yogurt. I like LaYogurt lowfat plain yogurt and it seems to work well for me. Once whisked well, pour into a container that has a spout for easy pouring. I like the plastic mixing bowl seen above. 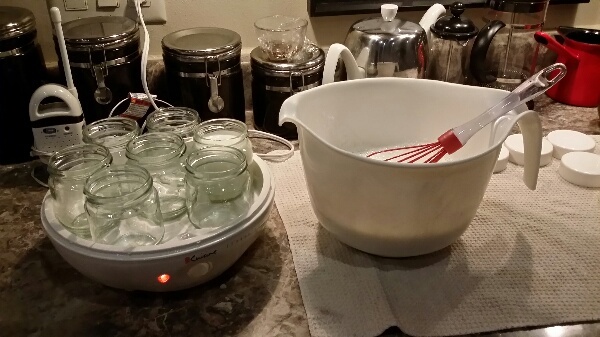 Pour the yogurt mixture into cleaned yogurt jars and cover with the top. Let sit in machine for 9 – 12 hours. I make mine over night a lot of times. Put plastic tops on them and put into the fridge for at least 3 hours to cool before eating. Great will some jams or jellies. Also wonderful with some honey drizzled over the top. If you like greek yogurt, you can easily do this with this yogurt as well. Very cool! I will have to try this. Thanks for sharing! For St. Patty’s day, do you have a corned beef recipe? Just curious! The only corned beef we have made, Paul brined and spiced himself. Then I think we grilled it. Corned beef really isn’t my favorite, but I have made a lamb stew that is fantastic for St Patty’s Day before. Sorry I can’t be of more help!